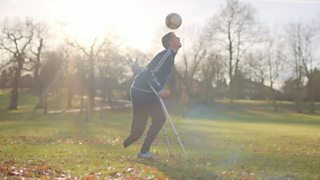 Amputee footballer Ray Westbrook once thought he would never play football again - here is his amazing story. Watch first-round highlights on the iPlayer from Saturday morning, 4 March and the Red Button from 14:10 GMT the same day and throughout the weekend. If you're competing in the FA People's Cup, please share videos and pictures of your best goals, celebrations and funny moments using #PeoplesCup on social media. The best ones might even make it onto an FA People's Cup programme on BBC iPlayer!